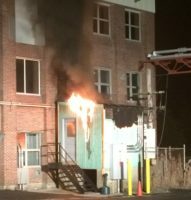 Wednesday morning, December 14, at 1:20am, we had a fire outside our building. Our transformer shed, two-feet from the building, exploded and caught fire. Acushnet Fire Chief Kevin Gallagher and his firefighters stopped the fire from spreading to our building, which would have put us out of commission at the busiest time of the year! Never mind the terrible thought of a fire fighter being hurt or the fire putting us out of business … literally! Building owner Rick Miller was on the scene right away and as soon as the fire was out, he was on the phone. A few hours later the two most professional Electrical Contractors in the area; Jope Electric and Sulyma Electric arrived to evaluate the damage and to help construct an action plan to get power back into the building. Rick secured a high capacity diesel generator, which was delivered later that same day and the fine folks at Warrior Fuels will keep the generator humming. We re-opened the next afternoon, 36 hours after the fire! Besides the sound of a generator humming away in our parking lot, it is business as usual. 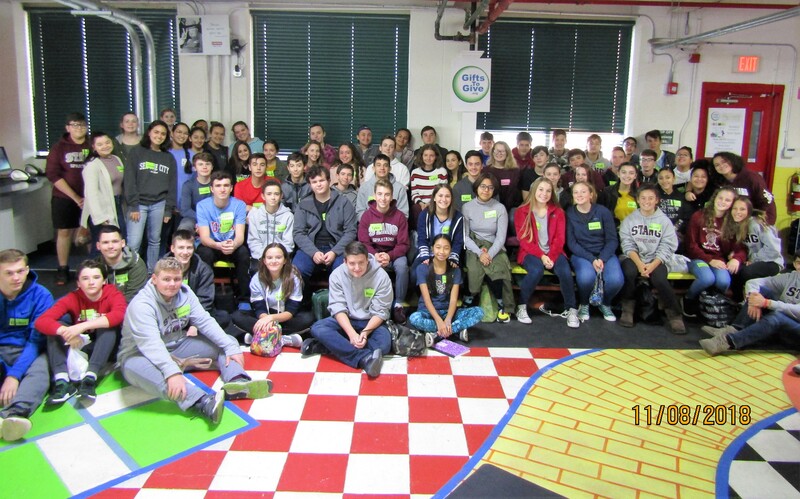 On Friday, over sixty local students came to volunteer along with 20 adults and we were able to distribute 125 gift packages of warm winter clothing, toys and books to local children in-need. All in all another magical day for us. None of this could have happened had the fire department been late, or not competent. Or the building owner not available or have a huge heart. Or the electrical contractors too busy or not professional. Or the daily fuel for the generator not being available or at the right price. 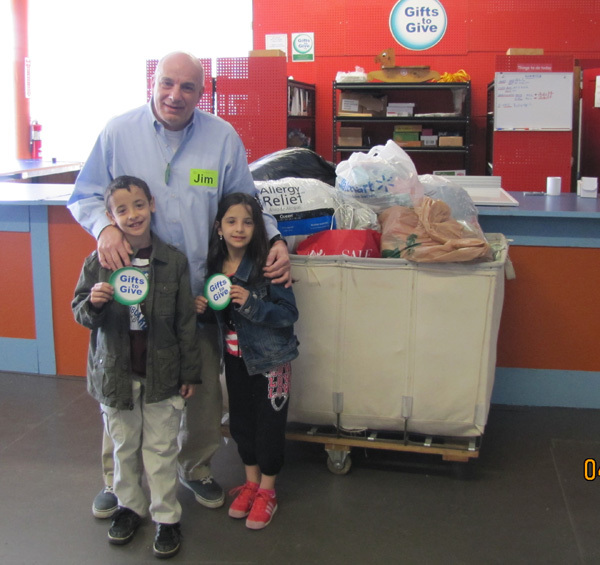 We are in the business of building a more caring community and today we were, in fact, a recipient of that caring community and it is as tangible as it gets. We are grateful beyond words! Tabor Academy’s Baxter House – ROCKS! 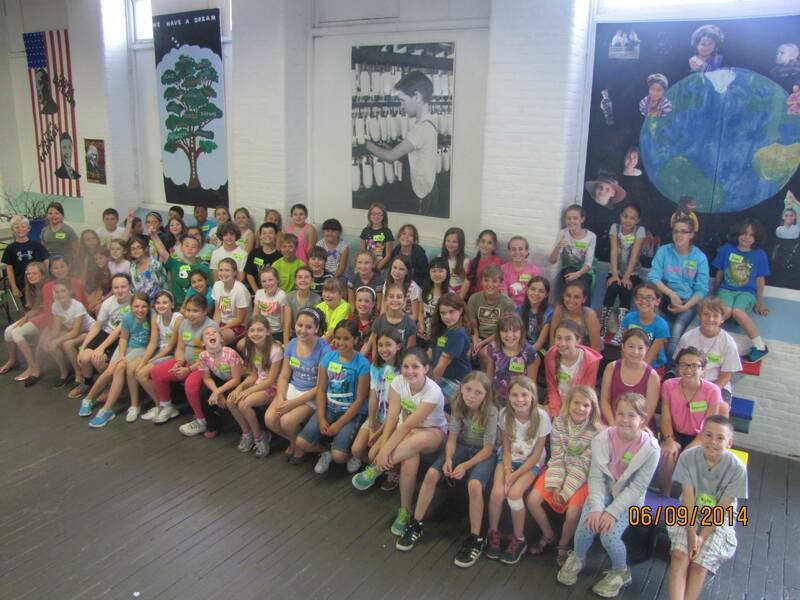 The winners of Tabor Academy’s first quarter “Green Wars” competition, were the 25 young women in Baxter House! They collectively chose to give back. Under the careful eye of the dorm’s “dean of green,” junior Sara Kosicki, the Baxter House residents were declared the campus’s best and most conscientious recyclers. As a result, money accumulated at the redemption center was given to the Baxter girls as a prize for their dorm’s thoughtful approach to caring for the planet. Rather than use the money for a weekend pizza party, the girls chose to use the money to buy socks and underwear. Why? Because they answered our call for help! Our supply of new socks and underwear, essentials many take for granted, is dangerously low. Hearing this, these amazing students acted! Ella is 7 years old and has a twin brother Liam. “I decided one day that I did not do enough for this country, especially children and wanted to help kids without clothes and do a clothing drive.” Believe or not.. her exact words! One of our annual traditions, is meeting the entire Bishop Stang Freshmen class at the factory. We could talk all day, about what is right about young people, but we prefer they talk for themselves. 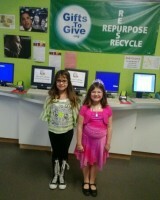 Hadleigh and Braelyn exemplify the power of giving! 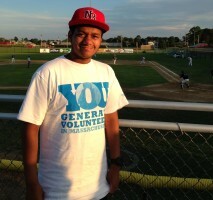 15 year-old Intern and New Bedford High School Sophomore, Camron Frazier was honored Friday night at the Bay Sox final game by SouthCoast Serves (a UMass Dartmouth initiative) for his extraordinary volunteer service. The Bay Sox ended their 2013 season with a 7-0-shutout victory over the visiting Ocean State Waves at Paul Walsh Field, which was nice! Where Do Youth Leaders Come From? We met four remarkable young women today. 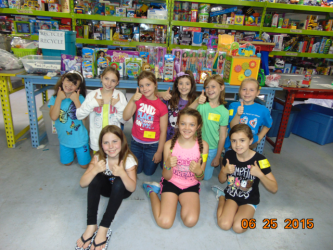 Girl Scouts all and they were on a mission – a mission to make a difference. 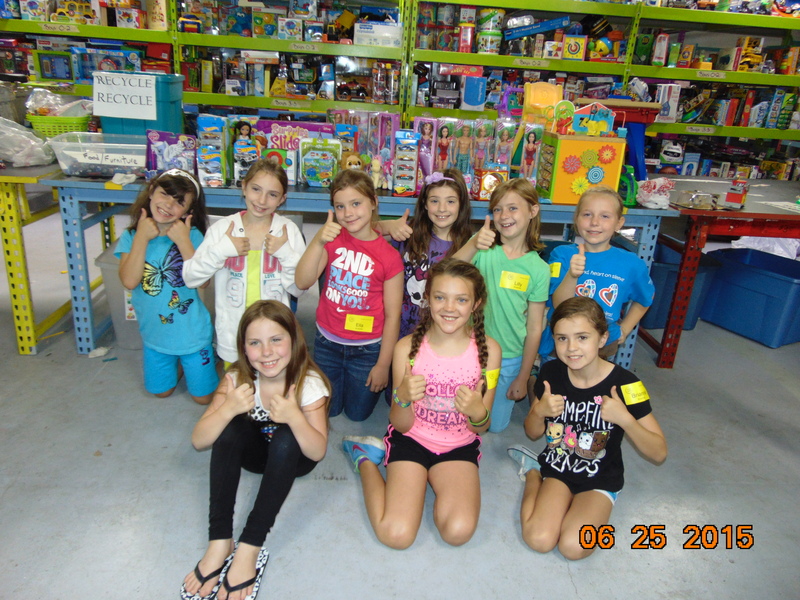 We asked their leader to write a short background on this small but mighty group, this is what she had to say – “When we started our Girl Scout season this year we had a significantly smaller troop. 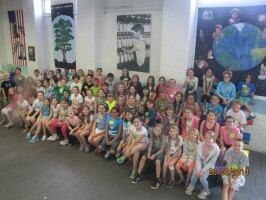 The girls that stayed had one common interest and that was to volunteer and make a difference. Last Saturday morning we met a most remarkable girl, who did a most amazing thing! 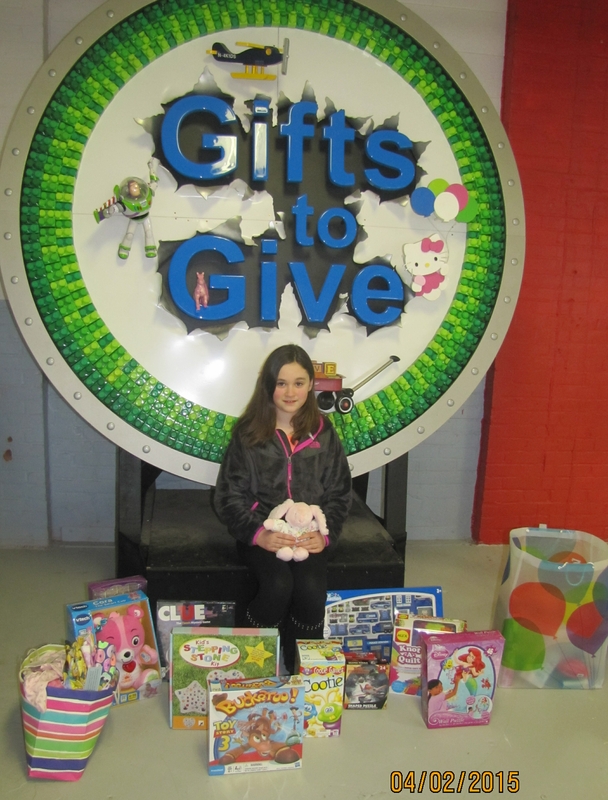 Caitlyn says: “There are so many needy children with no special toys. I am lucky to have more than I ever wanted. These children are very brave. I wish that these toys will give them a happy surprise on their birthday! It’s one thing for us to talk about what we do, it is entirely a better thing when a student volunteer talks about their experience. We are so proud of the students from Cardinal Spellman, and even prouder, if that is possible, of Charli. 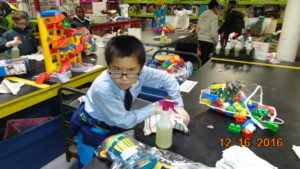 Changing Lives One Gift at a Time. My name is Charli Carey, and I am currently a junior at Cardinal Spellman High School in Brockton. 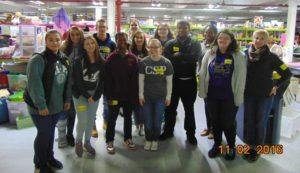 While preparing for our annual service day, several of my classmates and I struggled with the decision of which service site to volunteer at. 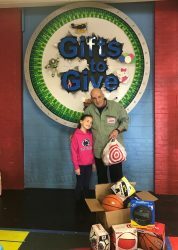 Last year, as a sophomore, I volunteered at GiftsToGive, and knew that I wanted to volunteer there again, this time as a junior. 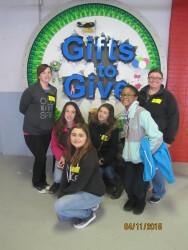 I spoke with several of my classmates about what they were expecting when they volunteered to serve at GiftsToGive. Student volunteers join the GNBSPC walk!